When the boy began walking away, an officer on patrol saw Spider-Man grab the child and refuse to release him. 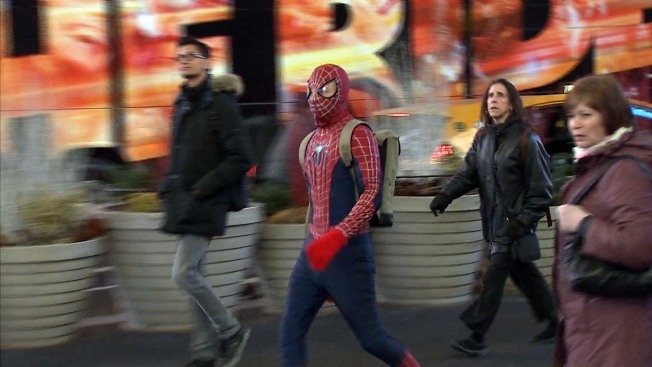 A costumed Spider-Man was arrested in Times Square Tuesday morning, accused of grabbing and roughly handling a boy when he walked away without tipping him for a posed photo, police say. Police said the 13-year-old boy took a photo with the costumed character at about 11:30 a.m. at West 46th Street and Broadway. When the boy began walking away, a cop saw Spider-Man grab the child and refuse to release him, according to a complaint. The character demanded money while holding the child between him and the child's father, the complaint said. The father told police he felt intimidated. The 29-year-old Passaic man in the costume was issued a summons for aggressive panhandling. The arrest comes weeks after people dressed in Minnie Mouse, Cookie Monster and Olaf costumes were arrested in Times Square after they allegedly blocked a man's path and insisted he pay them. Aggressive panhandling and sexual harassment by costumed characters in Times Square has long been a problem. Elected officials and The Times Square Alliance have called for regulating the characters. Mayor de Blasio last year commissioned a task force to explore possible solutions. The group submitted several proposals in October. In the meantime, plainclothes NYPD officers have been patrolling the square to combat aggressive characters.